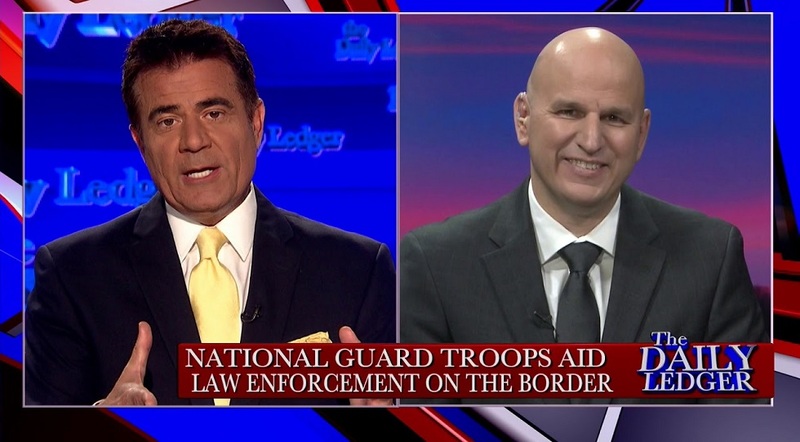 A U.S. Border Patrol union official appearing on “Fox & Friends” claimed that he believes the “Deep State” still exists within the USBP, internally frustrating President Trump’s border enforcement policies. At the same time the Democratic Party and its news media cohorts use any means necessary to open U.S. borders and block enforcement efforts. During the Obama administration, the least favorite agencies were the Border Patrol and the Immigration and Customs Enforcement directorate. Even Obama despised those agencies, although Obama hated cops period. As the estimated 14,000 immigrants in three separate “caravans” from Central America make their way through Mexico to the U.S. border, the Department of Homeland Security, especially the U.S. Border Patrol, is being requested to provide lawmakers from both sides of the aisles in the U.S. House of Representatives and the U.S. Senate updates on the Trump administration’s corrective actions. These corrective actions include upgraded air support provided by the Border Patrol and the Coast Guard. Although the nation’s news outlets zeroed-in on the so-called Trump Security Wall — ridiculing him and his supporters for wanting a barricade between the U.S. and Mexico — the Democratic Party position was that border walls or fences are ineffective despite numerous examples of the effectiveness of security walls throughout the world and even the United States. Examples include Israel’s security wall to control the entry and exit of the Jewish State’s Palestinian neighbors; and the security structure used to protect the Vatican, home of the Roman Catholic Pope. A U.S. Border Patrol union official appearing Thursday on “Fox & Friends” claimed that he believes the “Deep State” still exists within the USBP, internally frustrating President Trump’s border enforcement policies. At the same time the Democratic Party and its news media cohorts use any means necessary to open U.S. borders and block enforcement efforts. 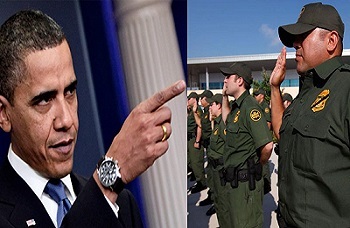 Brandon Judd, president of the National Border Patrol Council, recalled that when his group endorsed President Trump in March 2016, he received complaints from the top officials at President Barack Obama’s U.S. Customs and Border Protection. He said he was asked by then-Deputy Commissioner Kevin McAleenan to rescind the endorsement on behalf of Border Patrol agents, which he refused to do. “Many believed that Democrat Hillary Clinton would win the presidency and didn’t want to be locked out of the top positions in her administration,” said a former police adviser and Washington lobbyist, the late John Snyder. Congress also wished to learn of the border security updates, that includes the use of air support vis-a-vis helicopters, small aircraft and unmanned aerial vehicles (UAVs) or drones. 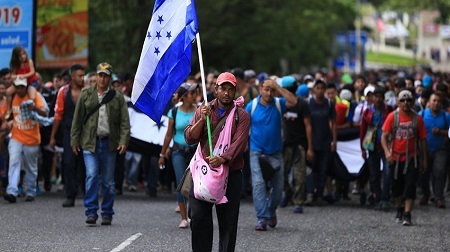 If these immigrants from Honduras are escaping crime and oppression in their country, why are they proudly marching with their country’s flag held high. In March 2017, a short time after a new administration moved into the White House, a representative from the National Border Patrol Council testified before members of the U.S. Congress that DHS Air and Marine Operations (AMO) rarely flew at night and that United States Coast Guard (Coast Guard) pilots had to fly missions for U.S. Border Patrol (USBP) agents in the Rio Grande Valley sector. Acting Inspector General at the Department of Homeland Security (DHS) John V. Kelly initiated an inspection in July 2017 to determine whether AMO and Coast Guard effectively supported USBP Agents at night in the Rio Grande Valley sector. Under the Trump administration, the AMO flew routinely at night to support USBP in the Rio Grande Valley sector. Because Coast Guard’s primary mission is conducting flights over water, its flight hours represented less than 1 percent of the Rio Grande Valley sector flight hours supporting USBP missions over land. Although AMO flies at night to support USBP missions in the Rio Grande Valley sector, AMO cannot meet USBP’s requested annual flight hours. AMO officials said they fly the budgeted flight hours in the Rio Grande Valley sector, but do not have the pilots or aircraft to meet all of the USBP’s requirements. AMO hours for USBP decreased 22 percent from FY 2015 to FY 2017 at which time President Donald Trump began to increase border security resources. AMO used temporary duty pilots in 2015 to supplement flight hours. After hiring pilots, at the start of the Trump administration, AMO increased training and non-enforcement hours, reducing hours supporting USBP. Inspector General Kelly reported that the CBP should improve its air coordination to respond to the highest priority of USBP requests. During the inspection, U.S. Customs and Border Protection (CBP) established an operations center to improve air coordination at night in the Rio Grande Valley sector, but the operations center did not establish metrics to gauge the effectiveness of air coordination. If CBP continues to implement the operations center and develop metrics to gauge the effectiveness of air coordination, those efforts should improve the effectiveness of air support in the Rio Grande Valley sector and enhance unity of effort among CBP components, the IG report stated. The Left is really not at war with the unalterable past. They are at war with the future.